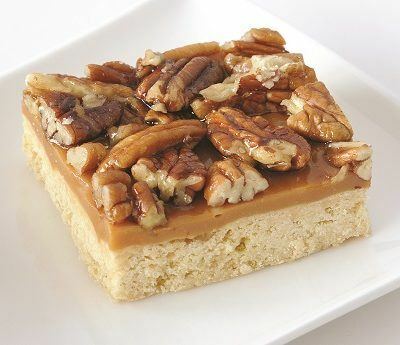 An all butter shortbread, topped with a generous layer of caramel and hand decorated with pecan nuts. Finished with honey to give an attractive glossy finish. Luxury Caramel (32%) (Sweetened Condensed Skimmed Milk, Glucose Syrup, Golden Syrup, Palm Oil, Butter (Milk), Sugar, Water, Emulsifier: Mono- and Diglycerides of Fatty Acids; Stabiliser: Pectin; Salt, Flavouring), Wheat Flour (Wheat Flour, Calcium Carbonate, Iron, Niacin, Thiamin), Butter (Milk) (18%), Pecan Nuts (9%), Brown Sugar, Sugar, Honey, Golden Syrup. Made in an environment where other gluten containing cereals, other nuts, egg, soya, sulphur dioxide, sesame and mustard seeds are used.